Every woman needs to read this blog post because we’re going to talk about one of the biggest fashion struggles of our lives. How does one create a wardrobe that fits her work life and her weekend life, with clothing that fits right and doesn’t break the bank? Well, I’ve done enough of the leg work here that I’m going to share with you some helpful tips! I know a lot of you that follow fashion bloggers look to them as experts but even as a fashion blogger I struggle with my wardrobe on a daily basis. It’s not all beautiful shots you see each week, there are tears, internal screams and buttons that pop off mid chocolate bar. If that wasn’t a hint for me to put it down, I don’t know what is…. and it wasn’t, because I finished the chocolate and bought bigger pants. Since there is a lot to cover, we’re going to learn about this in parts. Today’s post is all about shopping! 1. Office Job – Working with a Business Association is more than a tad different than working for yourself. Work hours consist of outfits that are professional and not too trendy. I need to have a wardrobe that can dress me for regular office hours and meetings with the board. I’m currently struggling with this one the most as I’m not into the typical office attire and need to also be comfortable. 2. Weekends – You’re more likely to catch me on the weekend in jeans, a t-shirt and my runners. I like to keep it super low maintenance when I’m not at work. I usually use my weekends to run errands and catch up with friends and family so cute, comfy and casual is key. 3. Blog Posts – This is where I get to have the most fun with my style because it’s low commitment. I get to be a little more editorial, trendy and wear heels with outfits I would probably wear flats with. Heels just make it all look best! 4. Media Events – There is usually a photographer at events so it’s key to look your best. This is where you get to mingle with your peers and make new contacts that may be from a brand. Sometimes I show up post-work and a little haggard but we cant win it every time! I would wear my “blog post” outfits to a media event. These are three or four ways of dressing but I need to aim to almost make it one multi-functioning wardrobe. 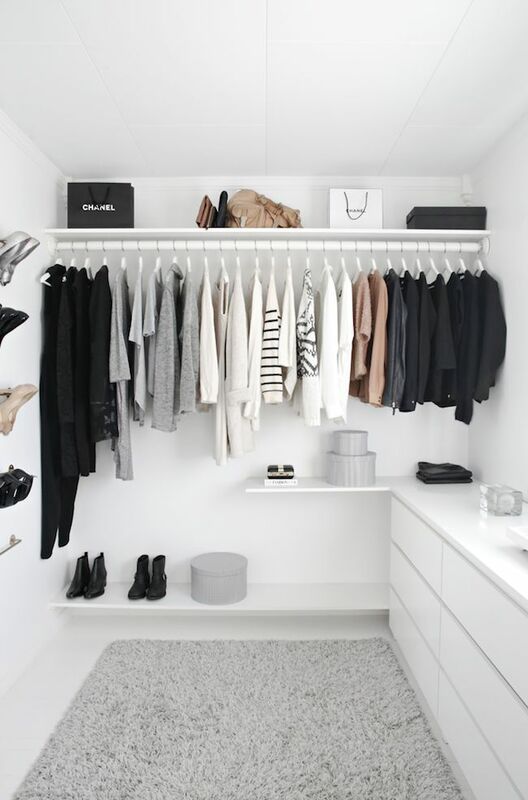 Before we break down a strategy on how to full fill this ONE wardrobe, we need to begin with the basics. 1. Undergarments – The right fitting bra and underwear can make all the difference when putting together your wardrobe and especially when you’re trying items on but we’ll come back to this. Be sure to get fitted for both once a year. 2. The essentials – I’ve said it before and I’ll say it again, before you start buying all of the trendy items make sure you own all of the basic items: blue and black skinny jeans, black trousers, neutral crew neck / v-neck sweater and t-shirt, black coat, black flat and heel boots, black pump, black flats. Once you have both of those covered, you’re ready to purchase everything else! Thankfully, I run a pretty minimalist wardrobe so this won’t be as hard as someone with a much more eclectic style but I think the basis all remains the same. Now we’re ready to shop but be warned, when you’re shopping for something specific, like new work clothes you need to be dedicated. When I’m shopping for work clothes, I shop alone. I hit every store that may have what I’m looking for and I try it all on. I don’t like to waste my time so taking items home isn’t an option unless it fits and I need to pair it with something I already own. 1. Make a list – It may be my type A personality but I like to create a list that includes all items I’m looking for. This can make your shopping experience a lot smoother as you won’t be deterred by other items. 2. Find inspiration – Before I shop, I like to find inspiration images via Pinterest. I type in the item that I’m looking for and find similar outfits that I would wear. Having images of what you want also makes it easier to shop as you will have the exact fit and style in your head while you shop. 3. Wear the right undergarments – Be sure to wear the appropriate underwear if trying on bottoms and if you’re trying on tops, it’s best to be wearing a bra that fits with no gaping. 4. Shop alone – When shopping alone, you’ll be more focused. You can spend your time on your own wardrobe and take as much time as you need to fulfill your list. 5. Ask for help – If you can’t find your size, ask for it!! I know the sales people can be super pesky but just ask them. Tell them everything you’re looking for and they can find you all of the options a lot faster than you can. 6. Try it on – TRY IT ALL ON. Fitting rooms are one of my most hated experiences. For some reason you go in looking all cute and exit looking like you got into a fight. Why am I so sweaty?? I’ve begun my own process of laying out my items in the order I want to try them on, I take my sweet time and I try items on more than once. Who cares if there’s a line up behind you, they can wait. Also, try items on with shoes. I will usually go with the shoes I’ll wear the most or will bring what I need to pair them with. 7. Ask about the return policy – If you aren’t 100% sure then make sure you can return it. 8. Buy sale items – Stores are ALWAYS having sales and I don’t like to pay full price for anything. I realized this when I started working in retail and saw how little items will go for. 9. Wait – If you have a very specific style in mind and cannot find it, wait. Trust me on this one, you’ll save yourself heartache and money. I’ve purchased a lot of items that were close to what I wanted but weren’t what I wanted and I spent a lot of money and didn’t end up being happy with the item. Now that I’m set on what I have to dress for, I own my essentials, I have my basics covered, and my list is created – I can shop! This post is getting a little long so I’m going to create 3 more posts to show you how to dress for work, weekend and other (for me it’s blog) using a few of the same main items. This should be fun! I’m curious to know where is your chest of drawers from? Hi Pri! Thanks for the comment and I’m glad the tips helped! I’ll be posting 2 more about work and weekend wear. As mentioned at the very bottom of the post, the image is via Pinterest. I wish it was my closet!! !